Unpublished studies about Paxil show that it carries a substantial risk of prompting teenagers and children to consider suicide. This renovated seven-bedroom home provides ocean views, a hot tub, pool and plenty of space for entertaining. Search for this and many other dream homes in the Outer Banks at realestate.nytimes.com. arnings by drug regulators about the safety of Paxil, one of the world's most prescribed antidepressants, are reopening seemingly settled questions about a whole class of drugs that also includes Prozac and Zoloft. Because the studies also found that Paxil was no more effective than a placebo in treating young people's depression, the regulators recommended that doctors write no new Paxil prescriptions for patients under 18. Experts say that the suicide risk is highest in the first few weeks young patients are on the drug. The concern that Paxil and drugs like it could cause suicide had been weighed, and rejected, by regulators a dozen years ago, amid early concerns about the group of antidepressants known as selective serotonin reuptake inhibitors, or S.S.R.I.'s. In the meantime, millions of people have taken the drugs, and many experts say that they have prevented far more suicides by teenagers and children than any reading of the new findings suggests they could have caused. Still, the warnings have the early critics saying they feel vindicated. Plaintiffs' lawyers who have uncovered evidence that they say shows drug makers withheld evidence of the S.S.R.I. 's suicide risk from regulators say the warnings give fresh urgency to their claims. And the findings have unsettled some of the very experts who absolved S.S.R.I. 's of a link to suicide a dozen years ago. Of the 10 American specialists who, as members of an ad hoc F.D.A. panel, formally cleared the drugs of a link to suicide in 1991, seven now say that the new information would prompt them to reconsider that decision, if they were asked. "In 1991, we said there wasn't sufficient evidence to support a link between these drugs and suicide," said Dr. Jeffrey A. Lieberman, a professor of psychiatry and pharmacology at the University of North Carolina and a member of the panel. "Now there is evidence, at least in children, and I wouldn't rule out that it's in adults, too." British health authorities have promised to "urgently" examine the implications of their findings for adults. The F.D.A. is considering whether to impose new restrictions on the use of the antidepressants. The agency's warning emphasized that younger patients "should not discontinue use of Paxil without first consulting their physicians," adding, "it is important that Paxil not be abruptly discontinued." While the regulators' warnings address only Paxil, many of the experts on the 1991 panel said all S.S.R.I. 's act similarly in the body, so concerns about one could apply to all. The drugs' manufacturers, which sell billions of dollars of S.S.R.I. 's every year, have treaded carefully in responding to the warnings. Without criticizing the regulators, they maintain that there is no proof that their drugs have a link to suicidal thinking in young patients — and they point out that the F.D.A. in the past found no merit in such claims. "We're trying right now to look at this issue with the F.D.A. and come up with an understanding together of what the data mean," said Dr. Philip Perera, a medical director of GlaxoSmithKline, the British company that makes Paxil. 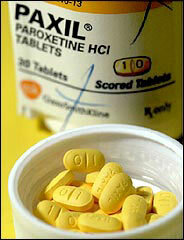 Pfizer, the maker of Zoloft, said that its drug was different from Paxil and had passed all F.D.A. safety evaluations, including one as recently as June 12. Eli Lilly & Company said that Prozac does not cause suicides. So far, there is little evidence that the warnings have affected doctors' prescribing practices. Teenagers and children account for about 5 percent of S.S.R.I. prescriptions, and companies that track the industry have detected no falloff in sales. "I can hardly imagine working without these drugs," said Dr. William Schreiber, a Louisville, Ky., internist. "These are good drugs, and I think they're safe drugs." But the warnings are beginning to seep into doctors' awareness. Connecticut officials, for example, last month dropped Paxil from their list of approved medications for foster children. And even doctors who do not believe there is a link between S.S.R.I. 's and an increased risk of suicide are emphasizing that patients need to be closely monitored in their first weeks on the drugs. "See them every day, if you need to," Dr. Perera of GlaxoSmithKline said. The drugs are widely prescribed by general practitioners, who do not have the same training in depression and treatment as psychiatrists. Get The Times for as little as $2.90 a week. Find more results for Drugs (Pharmaceuticals) and Medicine and Health .